Pictured above: Chasing23 founder, Darius Ballinger with some of his members during a career development workshop in 2017. Story by Jasmine Browley; originally published in May 2018. Darius Ballinger takes the chase out of finding a safe space for youth to gather. 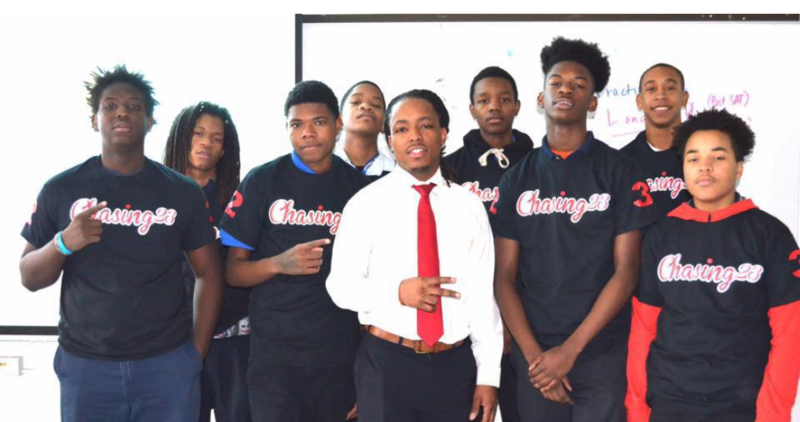 Darius is founder of Chasing23, a youth empowerment group that mentors and tutors youth ages 13-21, and gives special attention to African-American males, on Chicago’s South Side. He is a second-year On the Table host who will focus his 2018 discussion on improving the quality of life for Grand Boulevard residents. How did you first get involved in On the Table? Pictured above: Darius Ballinger, 2018 On the Table host, speaks about the importance of mentorship. Why did you decide to host an On the Table this year? What inspired your founding of Chasing23? What issues do you want to address at your table? Pictured above: Darius Ballinger, founder of Garfield Boulevard-based youth empowerment organization Chasing23, said On the Table sparked his idea to expand his mentorship group across several schools in his community. Here, he speaks to members about career development opportunities through education.